Looking for iPod music transfer to copy music from computer to iPod or vice versa? To easily transfer music file between iPod Touch/Shuffle/Nano and computer, in this article, we show you top 3 easy-to-use iPod transfer tools for your reference. "I'm a big fan of Taylor Swift and all her songs on my iPod are purchased & downloaded from Apple Music. But recently, I found that there isn't enough storage space on iPod to download her songs. Is there any suitable music transferring tool could help me to move songs from iPod to Mac?" As is known to all, users must pay $9.99 per month for subscribing or downloading songs from Apple Music. Without doubt, most of subscribers will choose to download songs for offline playback on iPod. Worry about no enough space on iPod to store new downloaded songs? No worries; you can apply a full-featured tool to copy existed songs from iPod to Mac for backup. Next, keep reading on to learn top 3 popular iPod music transfer software. Top-ranking music transfer for iPod - MacX MediaTrans can easily copy music songs from iPod to computer and vice versa. Songs of all genres, ringtones, voice memos etc can all be transferred back and forth easily! To perfectly and fast finish the task of syncing iPod music without iTunes, you should rely on an all-around iPod to computer transfer like MacX MediaTrans. 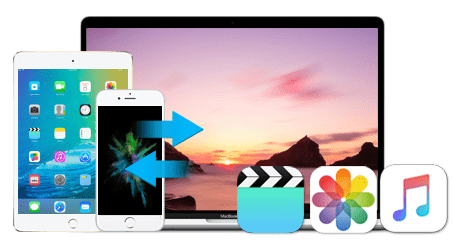 Serving as a professional iOS 10/9/8 music transfer software for iPod, it delivers you the superfast solution to move songs from iPod to Mac or Windows computer or vice versa in batches with no quality loss, including music, songs, playlists, mp3 files and more. BTW, it also provides you the easiest way to manage your music library, for example, create new playlist, edit music information, delete songs from iPod and more. Free download this iPod transfer on your Mac (macOS High Sierra included); turn to Windows version if you are a Windows user (Win 10 supported). Step 1: Launch MacX MediaTrans and connect your iPod Touch/Shuffle/Nano to computer via a USB cable. Later, the device will recognize all your iPod data automatically and instantly. Step 2: Click "Music Manager" button to select the songs you want to backup, or click All if you want to transfer whole iPod music to computer. Then hit "Export" button on the top to transfer music form iPod to Mac/PC. Step 1: Open this best iPod transfer and connect your iPod Touch/Nano/Shuffle with computer with USB. Step 2: Click "Music Transfer" icon to enter music management interface and tap "Add" button on the top of the panel to import music from computer to iPod. Then press "Sync" button on the lower right corner to transfer music from computer to iPod without iTunes. 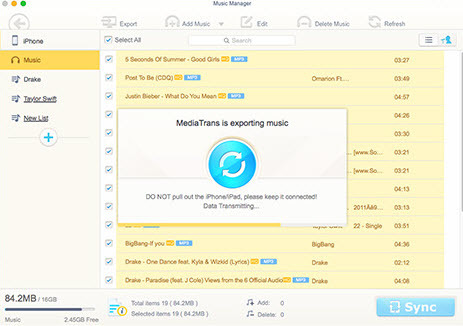 In addition to transferring songs from iPod to computer, this iPod music transfer also offers users two-way to copy music from iPhone/iPad to computer. Backuping photos from iPod to computer and transfering videos from iPod to computer or vice versa are two main bonus features for MacX MediaTrans iPod music manager. 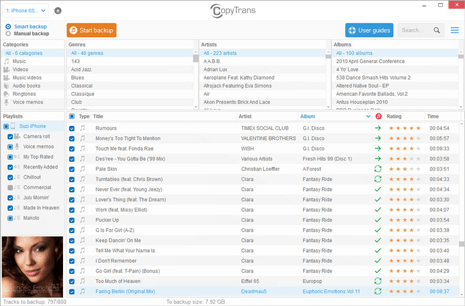 As one of the most solid iPod transfers, CopyTrans can copy all iPod music to PC & iTunes including artwork, playlists, ratings and playcounts with only one single click. And this feature-rich iPod transfer software allows users to create/edit/manage iPod playlists, delete songs, edit ID3 tags, add missing album, and more. Price is low and easy to use. Able to manage and save iPad iPhone users contacts, calendars, notes, bookmarks and more. Capable of playing iPod music or videos with the intergrated player. Slower transferring speed than the other iPod to PC transfers. iTunes can't run while using CopyTrans. Working as another blazingly fast tool for Mac users, Senuti iPod music file transfer can copy songs from an iPod to Mac or iPhone to Mac, including ratings, playcounts and cover art. 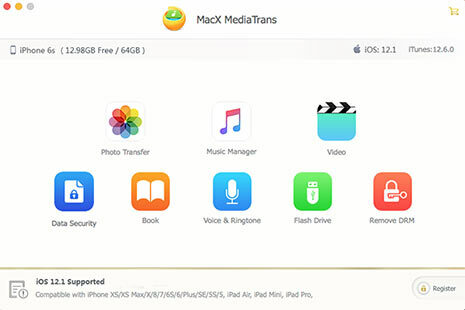 Of course, Senuti iPod to Mac transfer program also can download videos, movies, TV shows and podcasts from iPod to Mac (macOS Sierra supported) for storing. Free version of Senuti iPod Touch music transfer allows users to transfer 1,000 songs from an iPod. Wizard-style interface and easy to operate for beginning users. 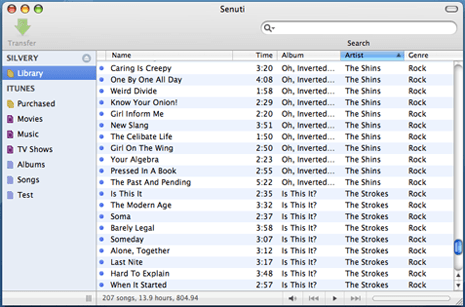 Can use iTunes and Senuti at the same time. Don't support transferring photos from iPod to computer. Best iPod music manager to batch transfer music, playlists, ringtone etc from iPod Touch/Shuffle/Nano to Mac or vice versa with world's fastest speed and no quality loss.